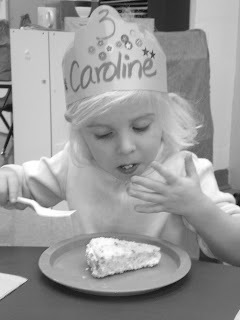 Krazy Krouse Kids: Happy 3rd Birthday, Caroline! Happy Birthday sweet girl! I can't believe you are already 3 or "free" as you like to say. In fact you have said it so much that Tucker thinks he is 3, too. I tried to sing Happy Birthday to you when you woke up this morning but you quickly reminded me that "they sing Happy Birthday at school" and you did not want me to sing. Thanks for helping me make your confetti cake last night while the boys were already in bed. Thanks for not eating it, too! I know you wanted "just a little baby taste" but you did a good job listening and waiting until school today to try it. You looked so pretty in the pink crown Ms. Julie made for you. You looked a little timid when your friends sang to you and in fact you covered your face for a bit. That was pretty silly for a girl who likes attention! 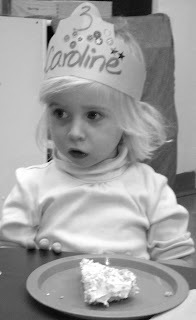 HAPPY, HAPPY BIG 3 BIRTHDAY TO YOU, DEAR CAROLINE!!! We so enjoyed having you, Tucker, Mommy and Daddy at our house this weekend! You are such a big girl! Happy Birthday Betty! We had a great time with you and TC this weekend. I hope to see you all again soon! Great pictures! So cute! Happy Birthday Caroline, sorry Emma was absent from school and missed that yummy cake!